Sunday afternoon of the AFC Championship game, the famous Patriots QB Tom Brady wore KT Tape on his suddenly infamous thumb. With the tape, Brady threw 290 yards and two touchdowns while leading his team on a 10 point 4th quarter comeback for his record 8th Super Bowl appearance. Was the tape the reason for the positive outcome? What is this tape and what does it do? Can it help you too (with an injury, not to play in the NFL)? KT Tape stands for kinesiology therapeutic tape. It is a strong, elastic tape that reduces pain, increases mobility and supports muscles and joints without restricting movements. 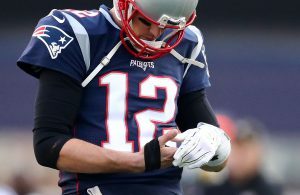 Brady was able to wear the tape to protect the stitches in his hand while maintaining full motion and grip in his thumb. But it’s not just for professional athletes. What makes kinesiology tape unique from traditional white sport tape is the ability to stretch. It will support without hindering movement. It is also designed to be waterproof and it can be kept on for up to 4-5 days. Because it is waterproof, it can get wet while bathing or swimming and still be effective. In Physical Therapy, we use kinesiology tape as part of the overall plan of care. is applied by a physical therapist along the muscle, ligaments, tendons or soft tissue to provide a lightweight, strong, and external support. It can work differently for different injuries and different applications. Depending on how it is applied by your physical therapist, it can support, enable or restrict the soft tissue. What conditions can be treated with kinesiology tape? Kinesiology tape can help with many conditions. If you have an injury or pain, kinesiology tape may be able to help you. After an evaluation by a physical therapist at Dedham Health Physical Therapy, kinesiology tape can become part of your rehab plan. For more information about programs and services at Dedham Health Physical Therapy, call 781-326-8332.